Did you know exercise can reduce your chances of getting Alzheimer's? Recent studies by the Cleveland clinic have shown just that: there's a direct connection between regular workouts and brain activity, and even the size of the brain area called the hippocampus, which shrinks from the disease, is normalized when you work out regularly. What does this mean for your own mental health? 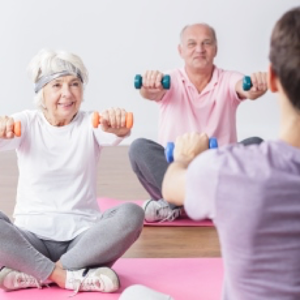 According to the Alzheimer's Research and Prevention Foundation, exercising at least 150 minutes a week can reduce your risk of Alzheimer's by up to 50 percent! In fact, women between the ages of 40 and 60 who exercised regularly showed a marked improvement in their cognitive development and memory. Simply put, an active lifestyle appears to hold the key to a healthy mind as well. What do they mean by exercise? They mean a combination of strength training and cardio, such as swimming, brisk walking, tennis, or using a treadmill or bike combined with weight lifting or resistance training. The trick is to get your muscles moving and your heart pumping, and the extra benefits will be that you retain your muscle mass while preventing osteoporosis at the same time! Of course, you'll need to talk to your own healthcare provider before you start or add to your exercise routine so you don't overdo or hurt yourself. Ask them what exercises are best for you, and keep the magic number of 150 minutes a week in mind so you can build up to it if you need to. Another way of working out to prevent Alzheimer's is to do brain aerobics every day. By that we mean using your brain for activities that involve more than one of your senses, break a routine in an unexpected way, and engages your attention. Examples are doing crossword puzzles, reading, writing, and board games. Think of it as mental exercise for your brain and you'll be on the right track; if it's a different and new activity that makes you think, you're probably on the right track. Although there currently isn't a cure for Alzheimer's, scientists are working on finding both the cause and the cure for this debilitating disease. Now you can be proactive and fight it too by staying active in both body and mind, and you'll greatly reduce your risk in just 150 minutes a week. Isn't that another great motivation for working out on a regular basis?